Me Me! I love to work ahead, it gives me a sense of accomplishment. So...I went right to work and knocked out this block. Here is my question though, is it wonky enough? 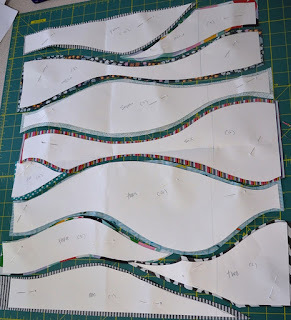 I am worried about having 3 rows that while different fabrics, follow the same pattern (vertical spacer lines). 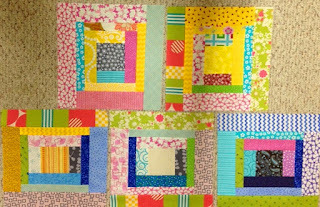 Here is my second block and I do feel this one needs to be re-done, it's just too simple. You see when I started in the Mod Mosaic Bee, I got a bit ahead of myself and didn't do it right, I had too many angles going on and it wasn't turning out very nicely. 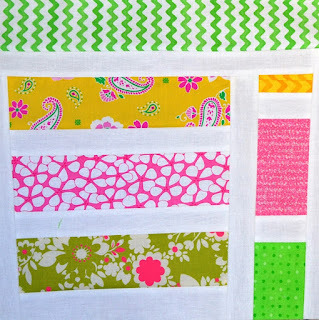 I didn't have a strip of white between each color and I thought it so easy that I was sewing it up so fast that I was not thinking about design, just sewing fabric so I had some pieces that I couldn't use. 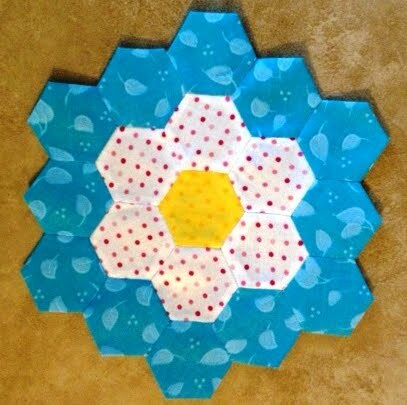 Tell me, is the top block wonky enough for a Mod Mosaic Bee or no? My block is going to be a challenge! I hope you are all up for it! I'm not even sure what it would be called...its curvy and challenging. I'm going to say its just a type of piecing haha Really the difficulty level depends on the design you create...I can tell you mine was very challenging so if you are not very experienced in this type of piecing then do not do small pieces or big curves. I was inspired by the water and how much I miss it right now! Deep breath. Sounds hard and I am a beginner. Ok, I can do this. Mind you the package sat on my sewing table for over 2 weeks, staring at me every time I came into the room but I just wasn't up for it. I was scared. Last week I had to dig in as I am prompt with my bee blocks and didn't want to be late. The time had come. Her directions were fabulous and anticipated lots of questions so they were already answered. First we just had to draw some waves, sounds easy enough. Then cut each piece of paper with a 1/4" seam to each fabric. She gave us an order to sew them in and also advised we mark each piece. It turned out ok, except for when I joined the top half and bottom half of the block, but I think that is ok. There is a bit of a ruffle where it does not lay flat, but she said that sometimes they don't lay flat. 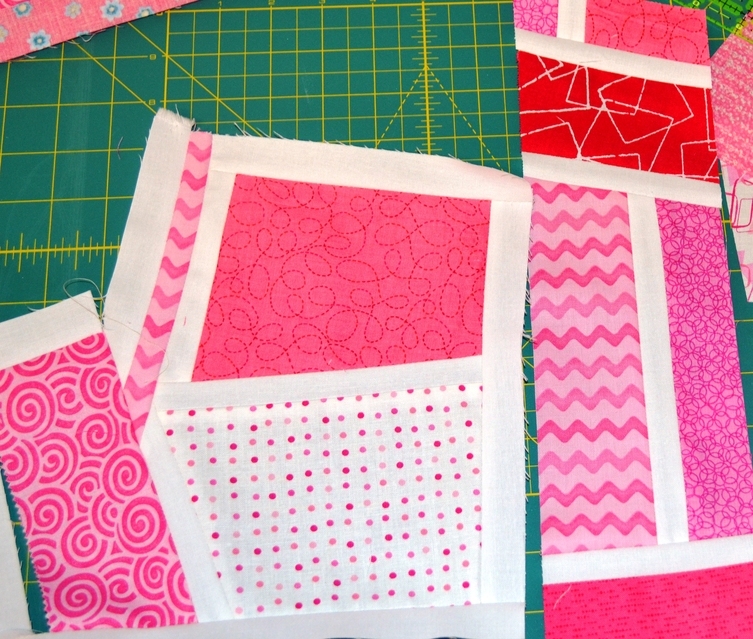 Imagine a whole quilt of these blocks, it's going to be beautiful! 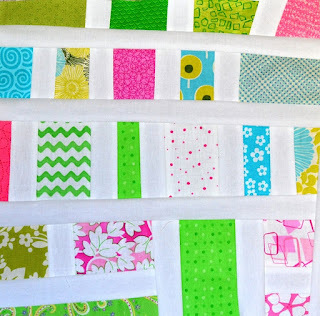 Just finished up some Garden Fence Blocks using this tutorial and they really are so easy! This has me thinking that I may just add a whole quilt of this block to my list. 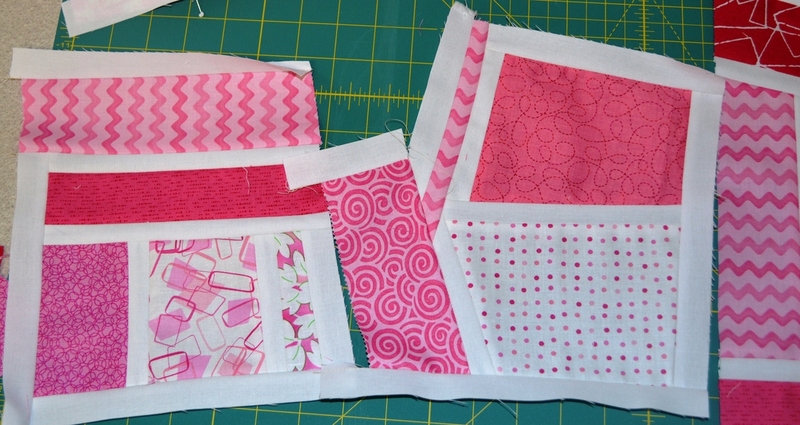 These two blocks are for Alisha in a Fall Bee and she requested pink and green. She only asked for one, but they were so quick and easy to do that I whipped up two for her! We are already a week into the New Year - Yeah! I have been a bit busy working on some projects. 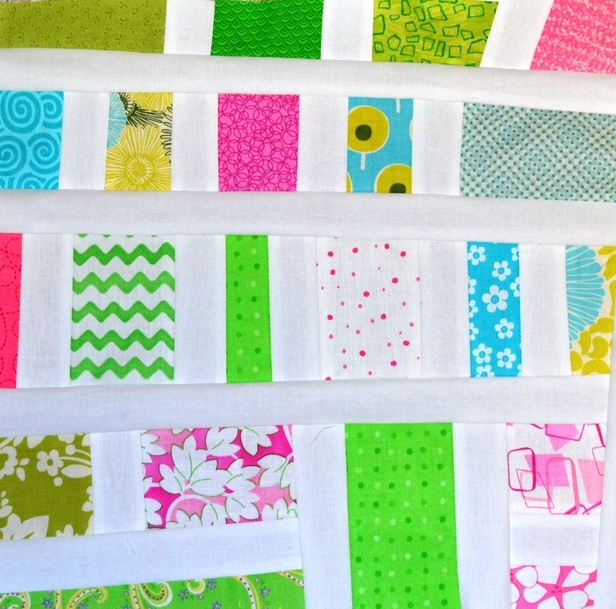 One - I am already getting blocks back from my Modern 99 Bee Members and they are so pretty! Two - I started and completed a couple of blocks for a Mod Mosaic Bee I am in this year. I decided on pink and here they are! Three - I have decided NOT to make the Summer Splendor quilt as I am not feeling the love I once was for it. The upside to this decision is that I have a WHOLE bunch of Kona solids and that makes me happy! Four - I have been surfing blogs, Flickr and all over the web for inspiration for yet another group I joined (I just can't stop myself, it's just so addictive) called "For the Love of Solids". 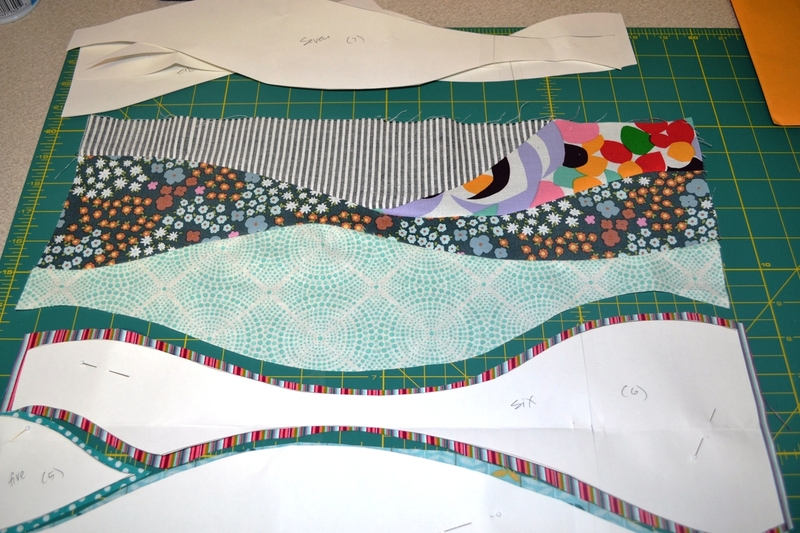 You make two projects, but the big one must be made out of ALL solids so I think I am well prepared, but we'll just see. I have not received my parter match yet so that could all change. That is a glimpse of this week. Stay tuned for more activites next week!